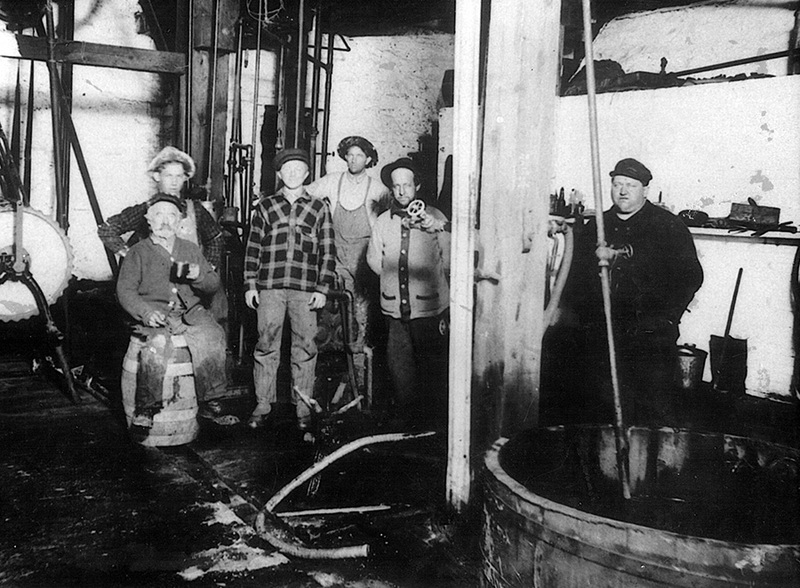 Brewery workers at the Oderbolz Brewing Co., Black River Falls, late 19th century. 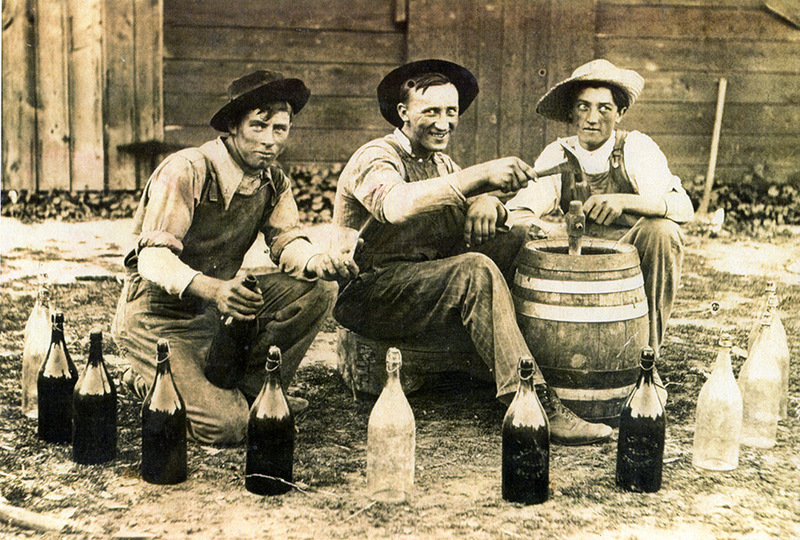 The Sand Creek Brewing Co.
Brewmaster and workers at the Oderbolz Brewing Co., late 19th century. 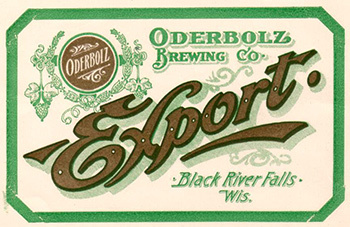 In 1856, Swiss immigrant Ulrich Oderbolz founded the Oderbolz Brewing Company in Black River Falls on the site of the present Sand Creek Brewing Company. Mr. Oderbolz cut his brewery into the side of a hill, as was the practice in those days, and created thick stone foundation walls to make a brew cellar for keeping the beer fresh -- in the winter, blocks of ice were cut from nearby Spaulding pond. Ulrich married Anna, another Swiss immigrant, in 1857, and in 1869 they built the red brick residence which still stands across the street from the brewery. They had eight children -- four boys and four girls -- and the brewery prospered. But tragedy stalked the family. On Feb. 15, 1888, 18-year-old Charley Oderbolz fell into a vat of boiling malt at the brewery, after losing his balance while standing on the edge. He fell forward full length, but managed to keep his head above water and climbed out. He was terribly scalded, and his clothing was removed, which only made matters worse by pulling skin off, and he lingered only until the following morning, when he died. 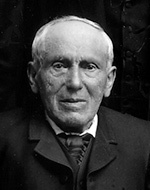 When Ulrich died in 1900 at the age of 80, his son Frank continued operating the brewery. 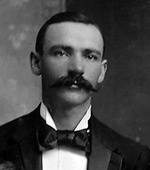 Frank had been president of the Jackson County Bank since 1897, and also found time to farm, serve on the common council, be a volunteer firefighter, and was even the supervisor of the committee in charge of building the dam over the Black River. It was the river, and the dam, which would prove to be Frank's undoing and the end of the Oderbolz Brewing Co.. On May 21, 1911, Frank drowned after going over the dam in a gasoline launch whose steering had gotten stuck. The boat belonged to Frank's friend, A.E. Homstad. A total of nine people climbed aboard that day. Homstad had wanted to test the boat for the season, even though it had been a very rainy Spring and the river was at a very high stage. Ulrich and Frank Oderbolz, circa 1887. Not long after launching, the steering mechanism stopped working and they had to shut off the engine. However, the boat had already gotten into the main stream and was headed straight for the dam. One man immediately jumped overboard and easily swam to shore, but the eight others remained on board until the bitter end. As the boat went through the dam it passed by a concrete pier where seven of the remaining eight managed to escape, but Frank was unable to, and went through the raging current to the rocks and whirlpools below. A huge $500 reward led to the discovery of his body a week later after the high waters finally went down. Two months after the death of Frank Oderbolz, his mother sold the business to a corporation of local businessmen (including one of the men who was in the boat with Frank), and it became known as the Badger Brewing Co.. 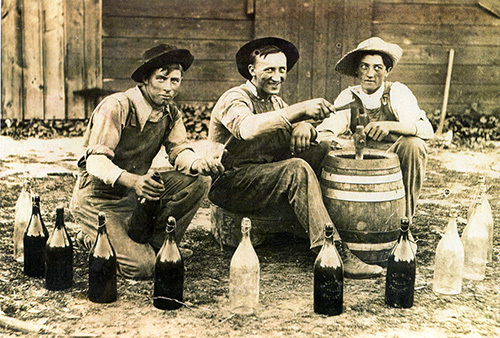 Most of the new owners were "independent saloon" keepers -- that is, they ran saloons not owned by the major breweries. Their new brewery would keep their costs down for their saloons in Black River Falls and along the Omaha railway between there and Eau Claire. The Badger Brewery only lasted eight years until being closed by Prohibition in 1920. They made a low-alcohol "temperance drink" called "New Style," but the building was sold to Miller-Rose, a poultry company, in the 1920s. In 1932, a devastating fire struck the building, destroying the second and third floors. It was rebuilt with a new second floor, and was later used as a soft drink bottling plant. The different shades of red brick today show the boundaries of the original brewery and the rebuilt second floor, along with an addition on the east side of the brewery where the loading docks are. In 1995, after an absence of 75 years, brewing returned to Black River Falls and to the old brewery building when the Hellman brothers, Dave and Jim, started the Pioneer Brewing Co.. They outfitted the brewery with the latest in brewing technology and hired brewmaster Todd Krueger. Launching the Pioneer line of brands, they took advantage of the growing surge of interest in craft-brewed, quality beers in Wisconsin. In 1998, Pioneer acquired the Wisconsin Brewing Co. of Wauwatosa, after two devastating floods of the Menomonee River in the space of one year, in 1996-97. Production of Wisconsin's Rainbow Red, Wood Duck Wheat, Whitetail Cream Ale, and Badger Porter moved to Black River Falls in 1998. In 2000, the brewery and brewmaster Todd Krueger won an unprecedented two gold awards at the World Beer Cup. Oscar's Chocolate Oatmeal Stout took the gold in the Oatmeal Stout category, and Pioneer Black River Red took top honors for the Oktoberfest/Marzen category. As if this weren't enough, at the next World Beer Cup in 2002, Pioneer again took home a gold award for Pioneer Oderbolz Bock, in the Bock category. In March, 2004, the Hellman brothers sold the brewery to a new company comprising brewmaster Todd Krueger and members of the Sand Creek Brewing Co. of Downing, Wisconsin. The original Sand Creek brew house at Schroeder farm, Downing, Wisconsin. 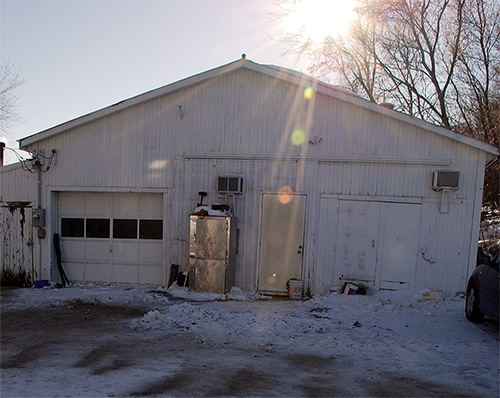 The Sand Creek Brewing Company began on a dairy farm in Downing, Wisconsin, about 20 miles northwest of the city of Menomonie. After homebrewing on the family farm for years, brewmaster Cory Schroeder teamed up with Jim Wiesender to found the brewery in 1999. Using equipment scrounged from various industries, such as a converted pudding tank for the brew kettle, the pair launched a successful business, brewing the beer just steps away from the chicken coop and a busy dairy farm. Their Sand Creek Golden Ale and English Style Special Ale, available only on draft and in half-gallon growlers, soon developed a reputation throughout Wisconsin's many brew fests. With a capacity of only about 150 barrels per year, the brewery, now with third owner Barry Houlehen on board, quickly outgrew the little farm shed converted into a brewhouse. Hoping to remain in the Dunn/St. Croix counties area, the company looked for a suitable place to relocate, but came up empty handed. Then opportunity knocked in the form of a phone call one evening from their friend in Black River Falls, Pioneer brewmaster Todd Krueger. The brewery was for sale. In March of 2004 the combined forces of the two breweries officially formed the new Sand Creek Brewing Co. of Black River Falls, Wisconsin.